Donate to Arts & Services for Disabled, Inc. Your financial support for Able ARTS Work (formerly known as Arts & Services for Disabled, Inc.) helps to create beauty, knowledge and joy in the lives of our students with developmental disabilities. Every gift is an investment in empowerment, education, self-expression of ideas, hopes and vision through the creative arts. Our students possess depths of talents and beauty to share with the world around them. It is through Able ARTS Work's creative arts services and daily opportunities that our students are able to express themselves, learn, grow and shine. We invite and encourage you to contribute in support of Able ARTS Work's progressive and important work. Arts & Services for Disabled, Inc. is growing through the diversity of programs and services to reach not only individuals with developmental disabilities, but at risk and under served communities. Through this growth we are able to bring more life-affirming, creativity-stimulating methods to more people, more families as well as the greater communities. Your gift is an investment in the arts, health & wellness, inclusion and the mission of Love before Learning. Learn for Life. 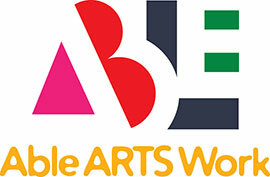 There are many ways to be a donor to Able ARTS Work. We invite you to select the one that is meaningful to you, and we look forward to welcoming you into the Able ARTS Work family of donors. Last year Able ARTS Work (formerly known as Arts & Services for Disabled, Inc.) created a giving program, which invited members of the Able ARTS Work family who were able to give at $1200 or more into our Patron Society with the goal of allowing Able ARTS Work the financial ability to step in with creative solutions to provide the love, learning opportunities and life options that our students need. Along with our hopes of growing the long-standing weekday programs we have been running for 33 years, we have also been working to grow our outreach programs such as Art on the Move, Mobile Arts Program, Accessible Arts Workshop, Creative Health and Wellness Clinic and exhibits and galleries to increase awareness and become a greater resource for our community. Many generous members of the Able ARTS Work family were inducted into the Patron Society for their contributions within the last fiscal year, which we were so very grateful for. With the next fiscal year upon us, we did not want to forget those who had already given at the Patron level, or for that matter, had been generously giving to Able ARTS Work over the lifetime of the organization. Keeping this in mind, we are very excited to announce that we have decided to honor those who have continued to support Able ARTS Work's mission, vision and growth by creating a cumulative giving program out of the Patron Society, rather than an annual giving program. These individuals will be honored at the next Artbeat for Humanity Gala during a special reception. We hope that this society will only continue to grow along with our Able ARTS Work family! To find out more about the program or support today, please visit Patron Society or call our Director of Development, Erin Madigan, at (562) 982-0249.